You might be thinking, I’m married and I don’t do dates anymore. Well, I’m here to say that even with a seasoned married couple, dates are essential. Why? Because there’s something about taking time out of hectic day-to-day to go somewhere special and be reminded why you fell in love in the first place. Dates do that. My husband and I are about to celebrate our 30th anniversary and we still make time to go out on dates at least once a month. Dinner and movies, listening to live music, exploring the historical districts in the towns surrounding us…things like that. Not all our dates are great ones. Sometimes we pick a restaurant that’s disgusting, at best. Or catching a movie that’s so boring we both fall asleep. Ha. It’s happened. Only to be rudely awakened by the climactic explosions or fiery gun chases at the end. I’m hoping you’ll help me out with a few possible ideas. First, I’ll share one of our date mishaps. It was supposed to be a birthday surprise kind of date. Mr. Castle drove over to the next town where there’s a great shopping area in their historical district. After walking around a bit, with him constantly checking his phone clock (which he never does), he started leading us toward the old-timey train station that connects to the stockyards in Fort Worth. (Another historical shopping district). Mr. Castle was all excited and rushing me along, so I knew something was up. But had no clue what he’d planned. But unfortunately, the train, being old, broke down. Something that happened often as of late. Ah, poor guy was disappointed, but I was so touched he’d set all that up for me. I wasn’t even upset at all. I felt special and loved and that’s the point of keeping the dates going. I’m going to toss this in, if you’re not married, meeting friends for a special date is important, too. And don’t forget to take your kids out on dates. Teach them while they’re young what it means to be valued and respected. So, how about you? Want to help me out by sharing a dating mishap? I might use some version of what you share in my story. If you post a story, I’m assuming it’s up for grabs. 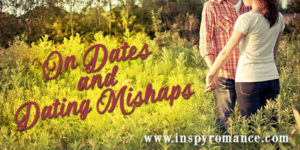 Or, if you don’t have any mishaps, share your favorite kind of date. What do you like to do? Or go? Thanks for your help! And get to planning your next date and who you’ll go out with. It’s fun! Making time for each other is essential. I’m hoping to one day ride one. ha ha. My favourite kind of date involves being outdoors- my husband and I were poor college students when we met, so dates tended to be simple and outdoors. I remember one time, we borrowed a mates’ old Gemini (car) and drove out to the lake to eat pizza one evening. Another time, a big group of us took tarps and sleeping bags and slept under the stars at a lookout in the mountains near college- even though we were in a group, it was a fun, special time getting to know each other better. Now, married with 2 young boys, ‘dates’ tend to be boys included- catching a steam train one way, then biking back; camping at the beach and having fish and chips in the evening. Hi Jackie! Thanks for sharing your not so stellar date. Hubby and I will be married 45 years on Saturday. As Wemble stated above we also had no extra cash, while Hubby attended seminary, so no fancy dates. One mishap happened on our “one day honeymoon,” since Hubby had just graduated from college with a new job he had to be to work on Monday morning. We spent Saturday night in a hotel in town and Hubby wanted to surprise me on Sunday and take me to the Schnitzel bank, a German restaurant in Grand Rapids, Michigan. He had never been there and had studied German in college. Since this was before the internet, he did not know it was closed on Sundays and Mondays. Having restaurants closed on Sunday and Mondays is a dating dilemma in small Michigan communities (similar to your Madison Creek), where no fancy restaurant (with white tablecloths and cloth napkins and stellar views of Lake Michigan) are open. Glad our anniversary is on a Saturday this year, so we can have our special date at our favorite restaurant Grand Mere Inn. We have been having special occasions there since we were first married. My husband, like yours, plans few adventures, because if there is a mishap he feels it was his fault. Often the best dates are the free ones. Walking along Lake Michigan or a picnic in the park. When our sons where home, Friday night pizza and movie night at home. Or a road trip through the countryside or along Lake Michigan. Best wishes on your next Michigan book, which I am anxiously awaiting. My dating story is similar to Renate’s. Our last anniversary was our 48 th on June 28. Last year ut was on a Wednesday. I skipped Ladies Bible Study and we went 30 miles to the next town to get a steak at a well known restaurant for lunch. We had looked it up on the interstate. When we got there it was closed. They were working on the facade. No note on the locked door. Just a bunch of bundleed papers on the ground in front of the door. Not even a notice on their website! We found another family type restaurant to eat lunch in, which has since closed. It was very hot that day but we went to several antique malls. I remember purchasing a little framed paper cutting for $1. But it was great spending time with hubby! I know how tight it can be while being in Seminary. It’s still hard in retirement. But God is faithful! I can’t even tell you how many times Mr. Castle has his stomach set on a certain restaurant. We’ll pass 20 others on the way there. My stomach will take anything at this point because I’m HANGRY, and when we get there, it’s closed down, or gone out of business, or something. Ugh. lol. My husband, then boyfriend took me to a restaurant and didn’t bother to see if they were open on Sundays. They weren’t. I can’t remember what we ended up doing. On our very first date he took me a fair but forgot to bring money–he had a checkbook and didn’t realize they wouldn’t take a check–this was 30 years ago. My dad had instilled in me to always have cash when on a date just in case. I ended up paying that day but lol I ended up marrying him so… Pretty much every time he tried to plan a date it was a disaster. Been there done that. See comment above. Ha. So nice of Mr. Castle to set up such a date! I’m glad you’re going to include dating mishaps in your book. I find it fun reading about them. I thought it would be fun. It’s a friends to lovers kind of story, I think. So he’s going to try impressing her with nice dates that don’t work out because he’s trying to impress her so hard. =) So far, that’s how it’s playing out in my head. On our 4th year anniversary my husband surprised me with a limo and dinner. After dinner I got food poisoning and the limo driver was late cause he had went and got his girlfriend (which wasn’t aloud). So instead of a romantic night I was hugging the porcelain bus. Yeah fun times. I would love to either ride in a hot air balloon or in a limo. I’d love to ride in a hot air balloon if only I got over my fear of heights. On our honeymoon in the Caribbean our luggage got lost for the whole time. We had to buy an extra set of clothes and wash them out each night. The airline finally found our luggage the night before we returned home. It was lost again the next day when we flew back. However it was delivered to our door in a day as we were back in the states. Not a date story exactly but the first thing that came to mind.